Calling all beauty junkies – Luxasia is holding a massive sale for you to snap up beauty and skincare products at a discount. Expect everything and anything distributed under the Luxasia umbrella to be available, with sales of up to 80% off! 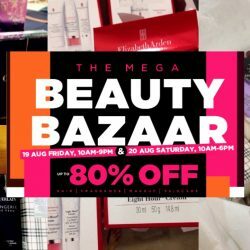 The Double 11 Crazy Sales have just ended, and BQ hopes that the damage to your wallet is not too deep cuz the mega popular Luxasia Festive Beauty Bazaar Warehouse Sale is happening this Thursday and Friday! The recent Luxasia Mid-Year Warehouse Sale was a mega hit with amazing offers like Aveda Anti Hair Loss Set (1L Shampoo and conditioner) going for only S$135 and the Anti Hair Loss Serum 55ml at only S$55! Eve Lom products were also heavily discounted as well as the popular Diptyque fragrances which were snapped up in a flash! 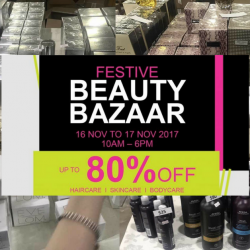 So prepare yourself, take your leave from work, jio your friends, and head down to Luxasia Building on 16 to 17 November 2017 to stock up on your favourite beauty products! Skincare and makeup junkies, mark these dates on your calendar now! The highly popular Beauty Bazaar Warehouse SALE by Luxasia is coming back from 25 to 26 August 2017! 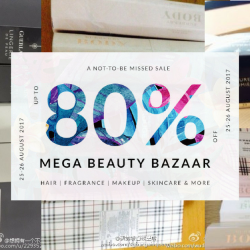 You will enjoy up to 80% on branded fragrances, haircare, cosmetics and skincare at this sale. Participating brands include Aveda, Eve Lom, Guerlain, Anna Sui, Lanvin, Decleor, Make Up For Ever and more under Luxasia! Dun miss it! Skincare and makeup junkies, mark these dates on your calendar now! 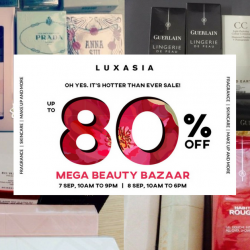 The highly popular Beauty Bazaar Warehouse SALE by Luxasia is coming back from 19 to 20 August 2016! You will enjoy up to 80% on branded fragrances, haircare, cosmetics and skincare at this sale. Participating brands include Burberry, Guerlain, Anna Sui, Lanvin, Decleor, Jurlique and more under Luxasia! Dun miss it! 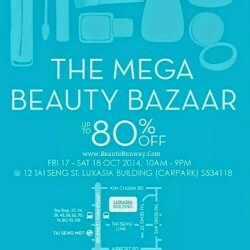 The super popular and highly anticipated Mega Beauty Bazaar by Luxasia is back! 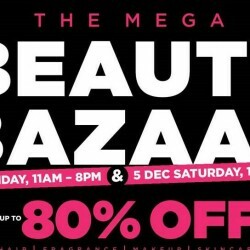 From 4 to 5 December 2015, head down to the Luxasia Building where the bazaar is taking place to get up to 80% off hair, fragrance, makeup and skincare items! There's no other better time and place to get your Christmas shopping done. Queue usually starts at least one hour before the opening day stated time so serious shoppers are advised to go early as fantastic buys can be snapped up within minutes! Check out our onsite pictures from last year's event! Luxasia BEAUTY, Cosmetics and hair care Brands SALE : Selected products and range only - Burberry| Guerlain| Stila| Anna Sui| Becca| By Terry| La Prairie| Philosophy| Carita| Decleor| Dr.Perricone| Darphin |Aveda| Jurlique| IPSA | Leonor Greyl Lancaster| Phytomer| Payot | REN| Evelom | Strivectin | Albion Exage Exica | RMK and more. LUXASIA PERFUMES BRANDS SALE – Selected fragrances, coffret sets, shower gel, hair and body wash, lotion - 55% to 85% off, prices from S$10 to S$75 for coffret set. Queue starts about 1 hour at least before the opening day stated time usually. Serious shoppers are advised to go early as fantastic buys can be snapped up within minutes once Luxasia Warehouse SALE starts and crowds are massive due to the huge discount offered. Accessible within 10 minutes walk from Tai Seng MRT, Circle Line or SBS bus no. 22, 24, 28, 43, 59, 62,70,76,80, 93, 159. Guerlain, as one of the major luxury beauty brands under Luxasia, has it's own counter selling cosmetics and fragrances at amazing prices. Do check out if you are a Guerlain fan. Location: L1 @ IMM, opening area near McDonald.